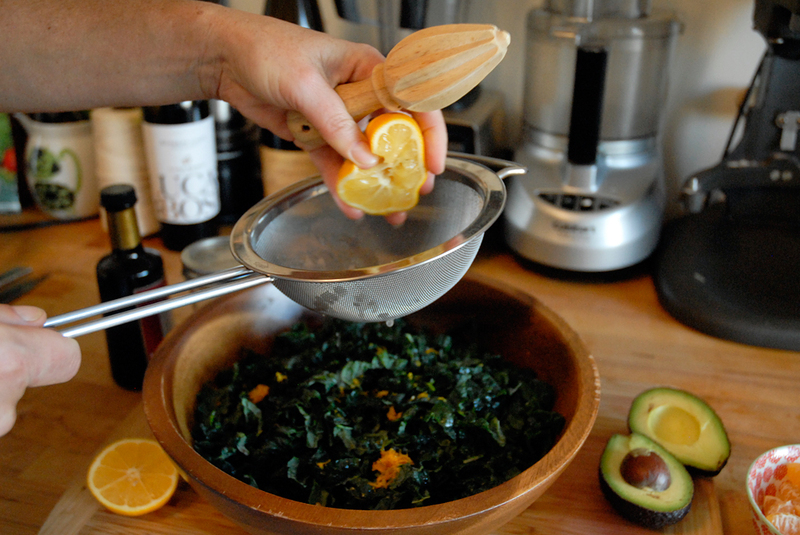 Yes, I know, who needs another kale salad? There are five zillion recipes out there already. But wait, and hear me out. 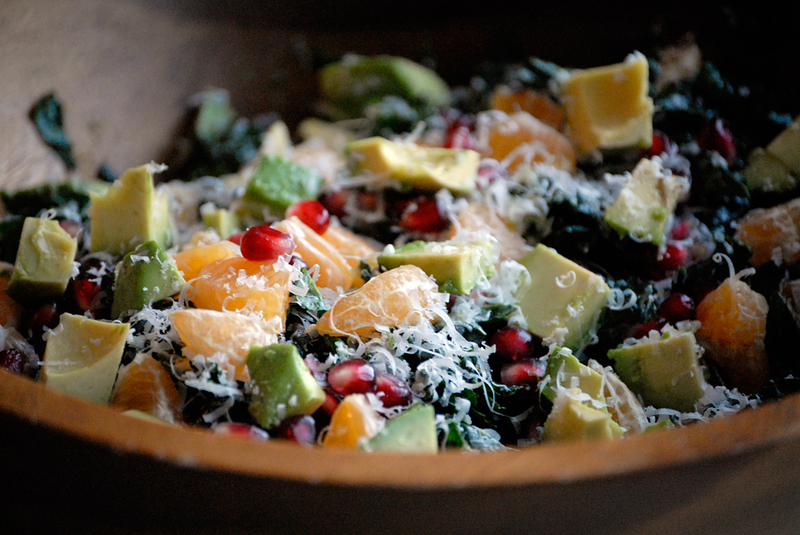 I have five really, really good reasons to make this salad. First, this one is really, really pretty. Bet you didn’t think that would be my first reason? It is so beautifully and festively colorful that it just begs to be noticed. “hello! I’m so pretty! (wave wave)” And once you notice it, you have to try it. 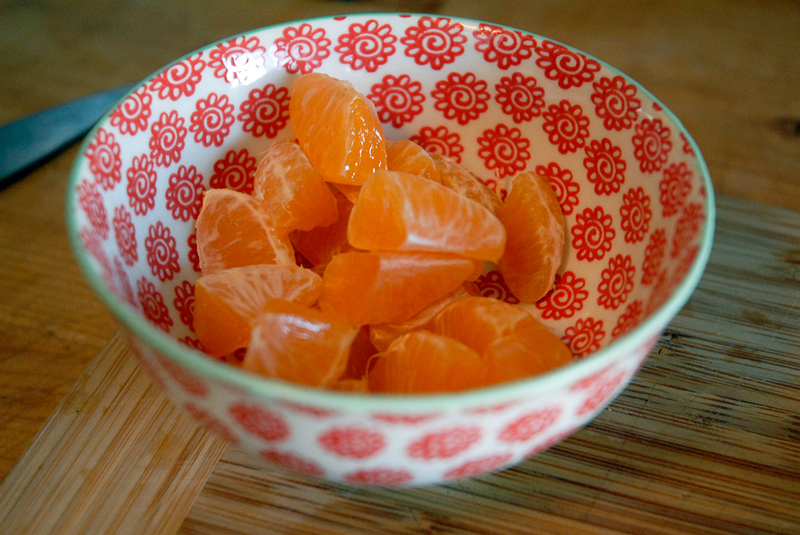 And then you discover that, second, it is really, really scrumptious! 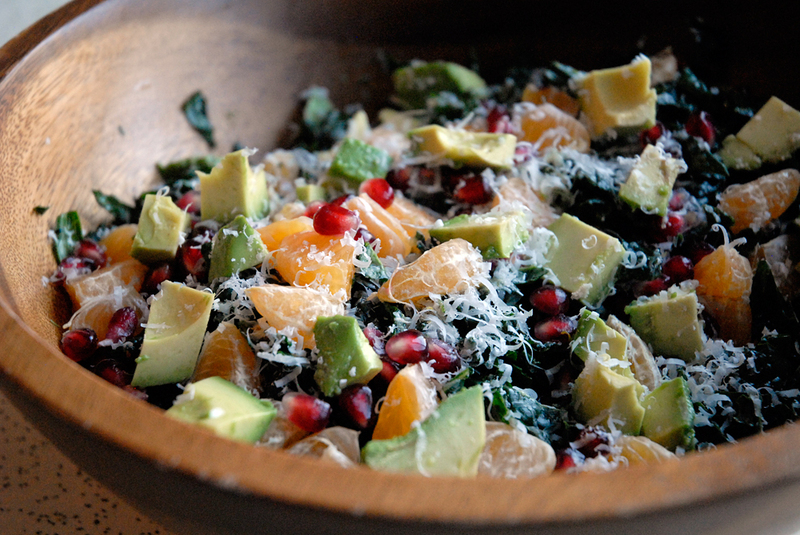 Earthy kale, creamy avocado, crunchy-juicy pomegranate seeds, and sweet tangerine are all highlighted by tangy Meyer lemon and salty Parmesan. Hello!? 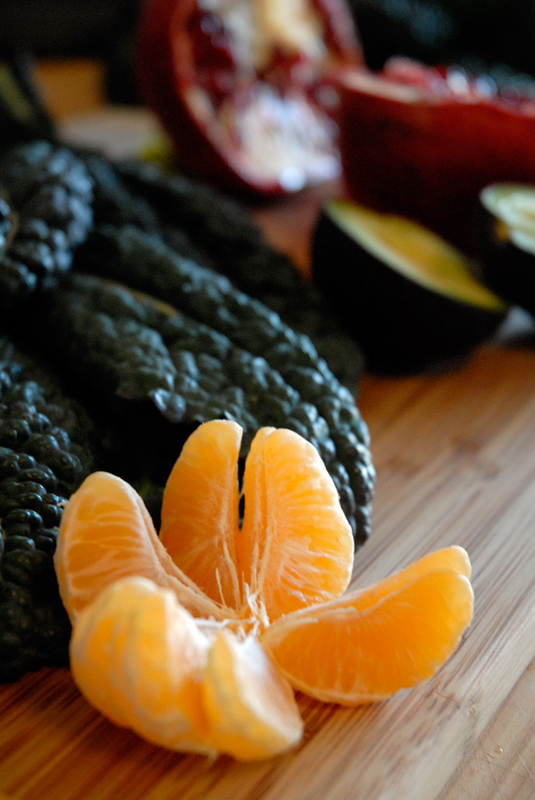 Now you’ve tasted it and you realize, “Wow, this is not only amazingly tasty but I think it is actually really, really healthy, and I like it!” So that’s the third thing. It’s actually healthy. Yep. 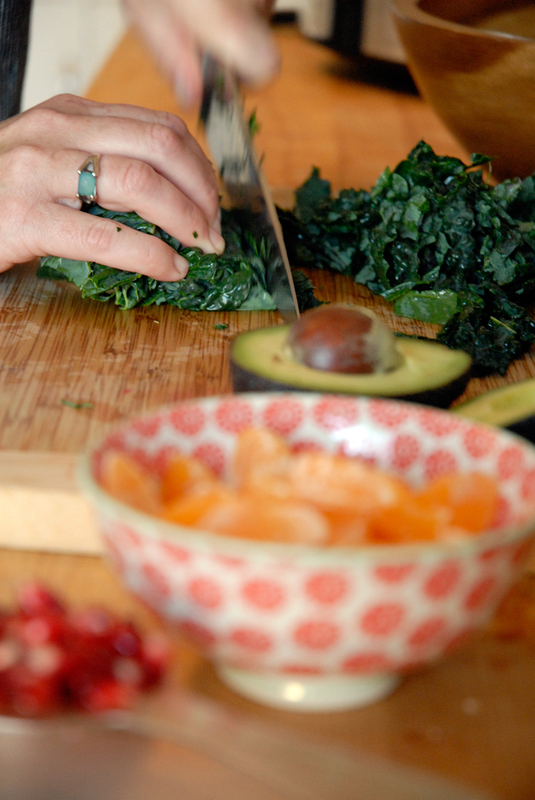 And you can serve it not only to your vegetarian friends, but also your gluten-free friends. So your guest list is [really, really] covered (that is #4). 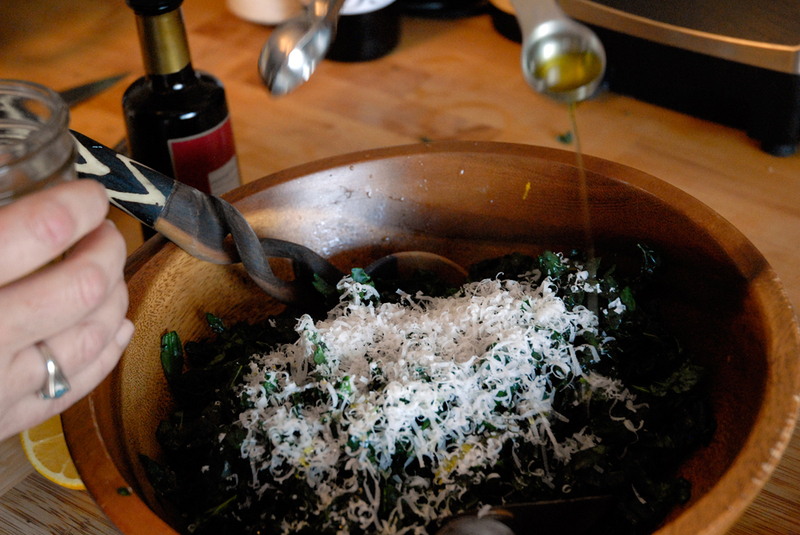 And, woah, back up just a second...last but not least, the fifth reason you should try this kale salad is that this salad is really, really easy to make. No, it is. My 2-year-old daughter helped me make it. I am not kidding you. So, there are five good reasons for you. And as a holiday bonus, I’ll tell you a few more awesome things about it. It is a perfect addition to Christmas dinner (or any dinner for that matter), nicely offsetting the richness of the other dishes on the table. 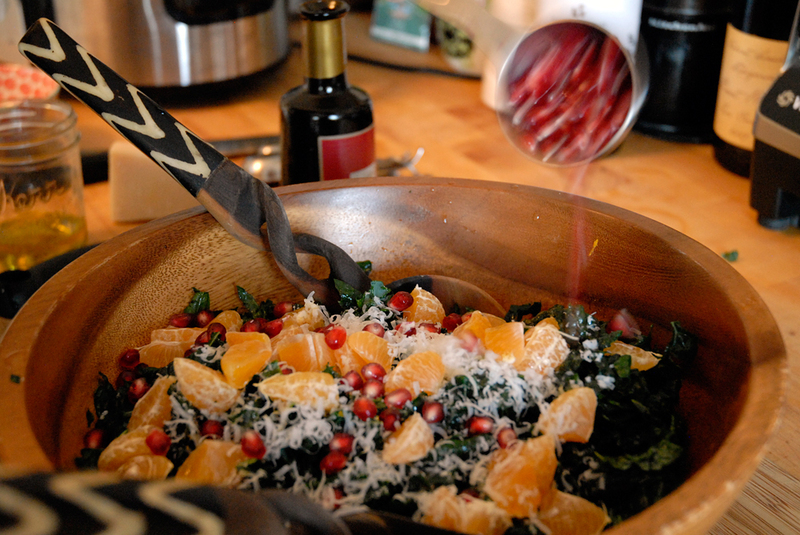 Also, this recipe can easily be doubled or tripled depending on the size of your gathering. 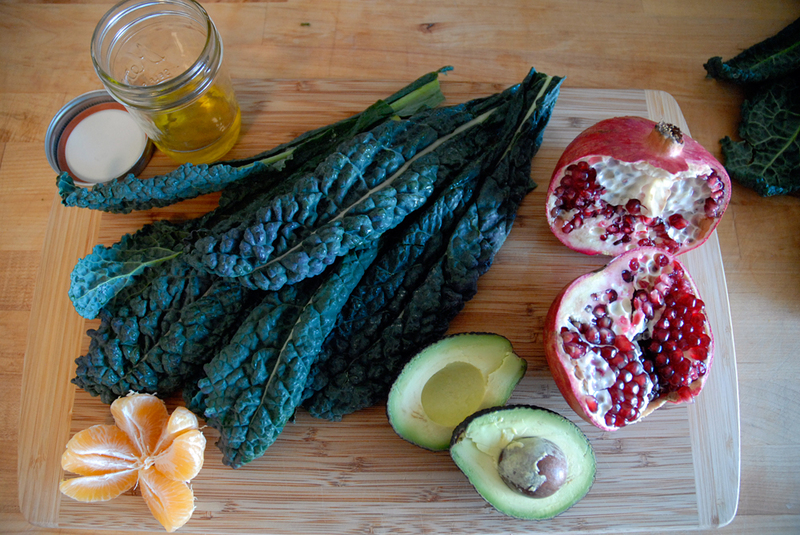 I hope for all these reasons and more you try and enjoy this pretty, scrumptious, healthy, veg-and-GF-friendly, easy kale salad! 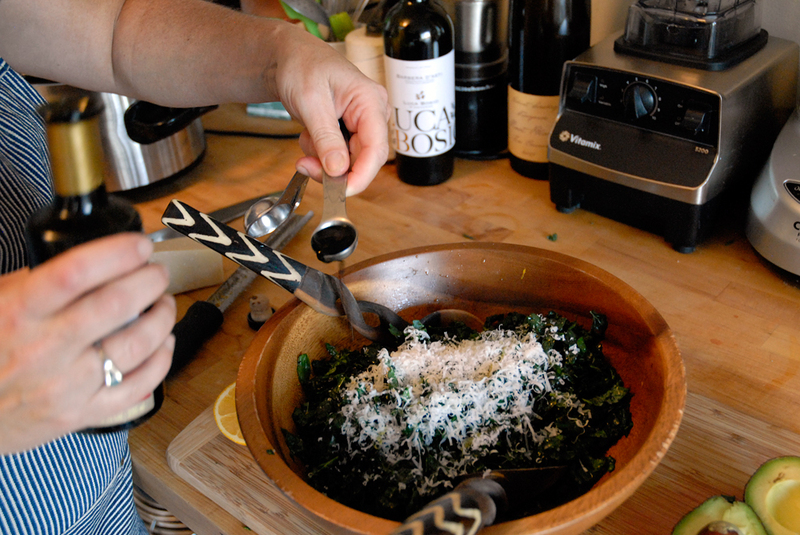 Strip the stems from the kale and discard. 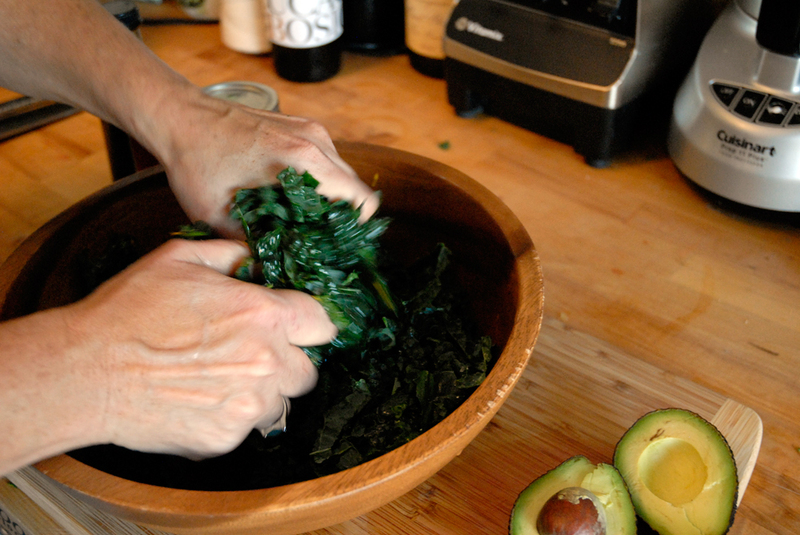 Wash the kale leaves, roughly chop, and place in a large bowl. 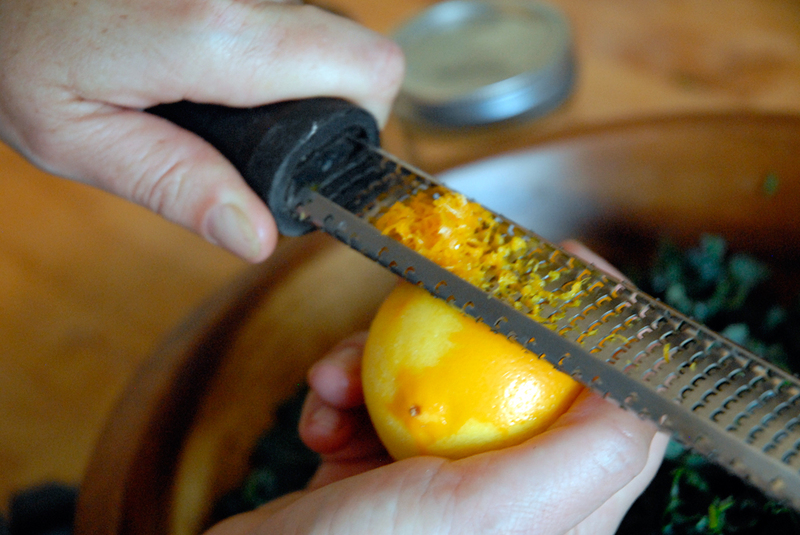 Sprinkle with a little salt, the lemon zest, and the lemon juice. 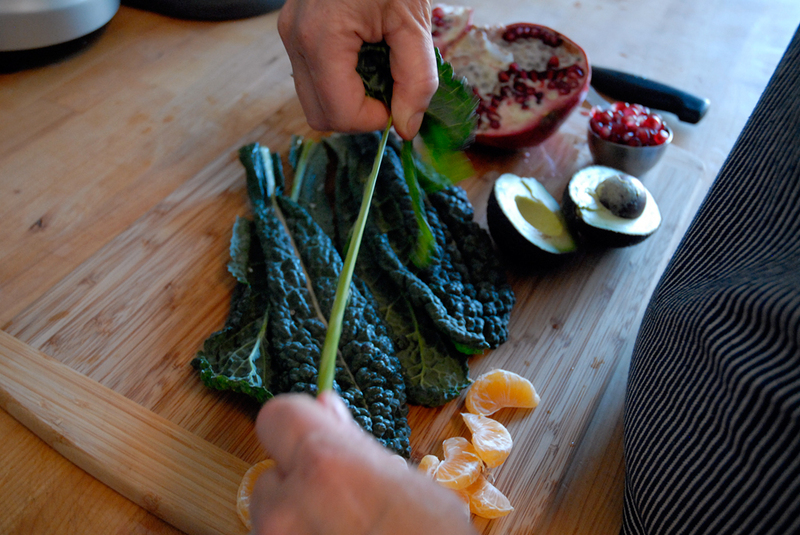 Massage the kale with your hands until it starts to look a little wilted, about 1 minute. 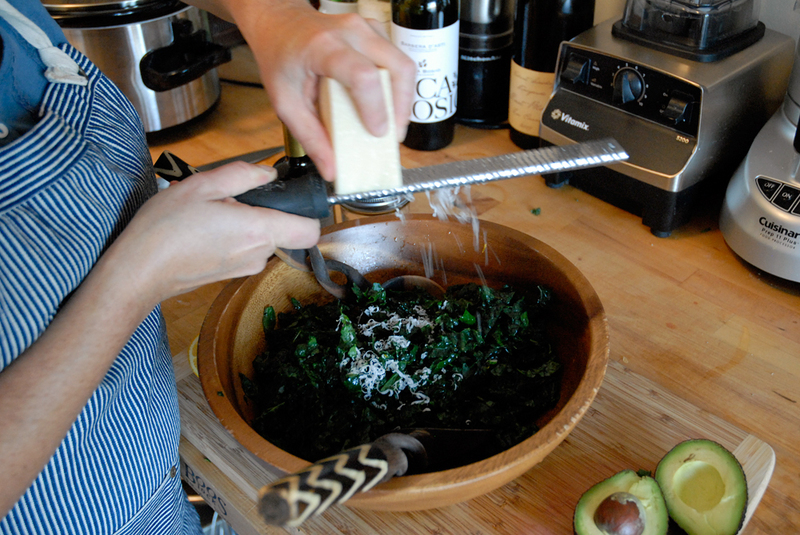 Add the Parmesan, oil, and balsamic to the kale. 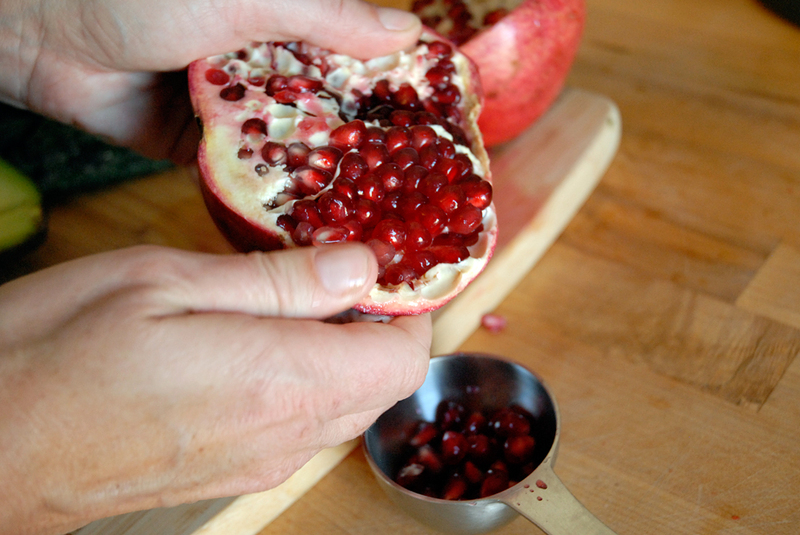 Toss to coat, then toss in the pomegranate seeds, tangerine slices, and avocado chunks. Toss to coat again, season with salt and pepper to taste, and serve.